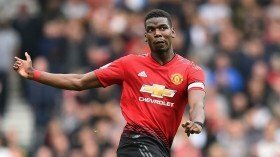 United open to Pogba sale? The France international has been linked with the European champions in recent weeks following an interview where he revealed his ambition of playing for Los Blancos in the future. According to Marca, the Red Devils are open to the prospect of selling Pogba in the summer but Los Blancos would have to come up with a bid of at least £130m for his services. United boss Ole Gunnar Solskjaer recently said that he would prefer to stick with the midfielder for years to come, but reports have since indicated that the relationship between the pair has deteriorated. Pogba is currently enjoying his best-ever campaign in the United shirt and he has contributed 16 goals and a further 11 assists for the club across all competitions. He has two years left on his present deal with the option of another 12 months.